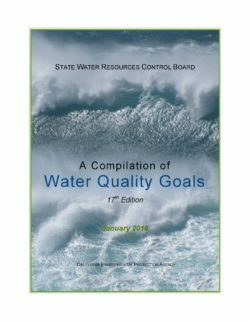 This State Water Resources Control Board (State Water Board) staff report, A Compilation of Water Quality Goals, supersedes the April 2011 edition and all prior editions and updates published by the State Water Resources Control Board and the Central Valley Regional Water Quality Control Board. Earlier editions and updates should be discarded, as they contain outdated information. 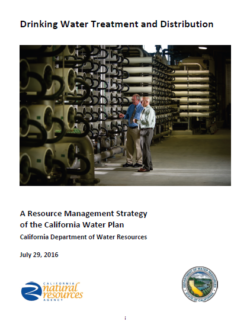 The text of this edition has been updated mainly to reflect the transfer of California’s Drinking Water Program from the Department of Public Health (CDPH) to the Division of Drinking Water (DDW) at the State Water Resources Control Board (State Water Board). Information about this transfer is online at http://www.waterboards.ca.gov/drinking_water/programs/DW_PreJuly2014.shtml. Cited examples and hyperlinks to reference materials have also been updated. The narrative Selecting Water Quality Goals contains information to help users to understand California’s water quality standards adopted to protect the beneficial uses of surface water and groundwater resources, available criteria and guidance for evaluating water quality, and to help users select defensible numeric assessment thresholds based on applicable water quality standards. To use this information correctly, it is necessary to read Selecting Water Quality Goals carefully before using numeric thresholds from the database. Water Quality Goals is a technical report prepared by staff of the State Water Board. It is intended to help identify and assess potential water quality concerns. 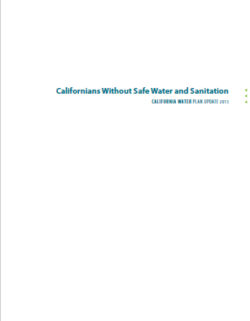 This report is an informational tool only and does not establish State Water Board policy or regulation. 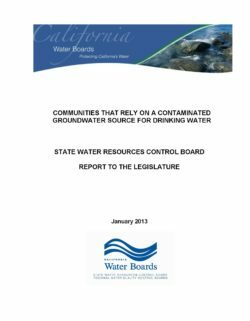 The information presented in this report is not binding on any person or entity, nor does it represent final action of the State Water Board or any Regional Water Board. This report is not intended, nor can it be relied upon, to create any rights enforceable by any party in litigation in the State of California. The overseeing regulatory authority may decide to use the information provided herein, or to act at a variance with the information, based on analysis of site and case-specific circumstances. A new pilot study in California shows many households, even within affluent communities, routinely spend over the affordability threshold of 2 percent of their household income on their water bill. The number of water systems with “unaffordable” rates varies by region and measure used – which has important implications for policy makers. 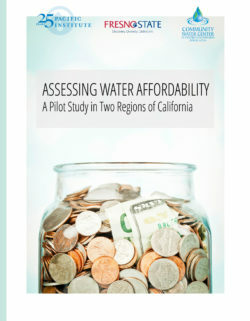 Assessing Water Affordability: A Pilot Study in Two Regions of California, from the Pacific Institute in partnership with Community Water Center and Fresno State University, looks at both an urban and rural case: the Sacramento metropolitan area and the Tulare Lake Basin. In Sacramento, using the most common form of determining affordability – the annual water bill as a percent of median household income at the water system scale – few water systems appeared to suffer from unaffordable rates. In contrast, in the Tulare Lake Basin, 18 percent of systems had unaffordable rates. Using a more fine-grained measure based on household income levels reveals even higher levels of unaffordability in both regions. In the Sacramento metropolitan region, measuring on a water-system-wide scale vs. a household scale means the difference between recognizing zero water systems with unaffordable rates vs. 100,000 households with unaffordable water rates. In the rural Tulare Lake Basin, measuring on these different scales means finding only nine out of 51 water systems with unaffordable rates vs. nearly 4000 households with unaffordable water rates – some 40% of the households in the study group. 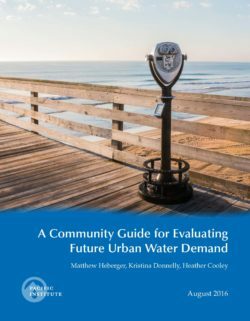 The study’s results show that a significant number of areas within water systems have unaffordable rates, even if the system as a whole does not, and so it may be more important to consider household income rather than median income when assessing and addressing water affordability. While most Californians enjoy access to safe drinking water and adequate sanitation, some residents live in communities or areas that do not have access to safe drinking water and/or adequate sanitation facilities. This report provides a framework for estimating the number of Californians that lack safe drinking water and/or adequate sanitation facilities. It also focuses on small (rural and urban) communities and tribal communities who often face similar challenges in accessing safe water and providing adequate sanitation. 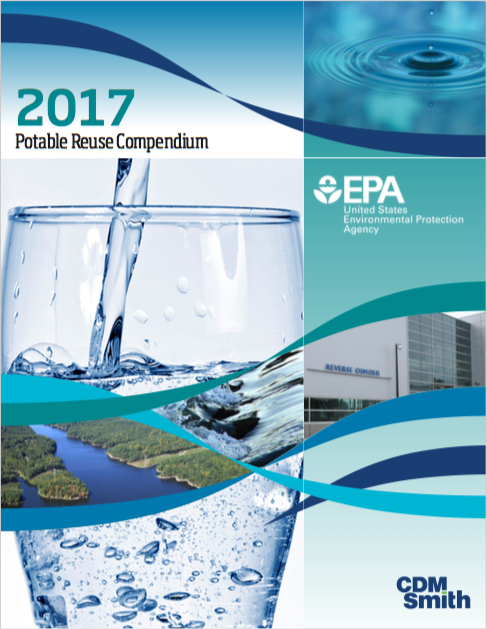 These challenges include aging infrastructure, more stringent water quality standards, financial capacity, and the affordability of operation and maintenance costs associated with new treatment systems. In recent years, there has been significant progress in heightening the awareness of the drinking water and sanitation problems facing small and disadvantaged communities in California, as evidenced by the numerous plans and reports on the issue. However, despite these efforts, there is still a lot of work to do to ensure that all Californians have access to safe drinking water and sanitation. In support of this effort, the report lists 14 recommendations that were developed with input from State agencies and public stakeholders. AB 2222 (Caballero, Chapter 670, Statutes of 2008) requires the State Water Resources Control Board to submit a report to the Legislature that identifies: 1) communities in California that rely on contaminated groundwater as a primary source of drinking water; 2) the principal contaminants and other constituents of concern; and 3) potential solutions and funding sources to clean up or treat groundwater or provide alternative water supplies. A “community,” for the purposes of this report, is defined as a Community Public Water System (Health and Safety Code Section 116395). When this report refers to communities that rely on a contaminated groundwater source, it is referring to community public water systems that draw water from a contaminated groundwater source prior to any treatment. Over 95 percent of the 38 million Californians get their drinking water from a public water system. The findings in this report do not reflect private domestic wells or other unregulated water systems since the state does not require these groundwater users to sample their wells, and consequently a comprehensive database for these groundwater sources does not exist. This report identifies 680 community water systems that, prior to any treatment, relied on a contaminated groundwater source during the most recent California Department of Public Health (CDPH) compliance cycle (2002-2010). It is important to note that, according to CDPH, over 98% of Californians on public water supply are served safe drinking water. Although many water suppliers draw from contaminated groundwater sources, most suppliers are able to treat the water or blend it with cleaner supplies before serving it to the public. Consequently, when this report refers to communities that rely on contaminated groundwater, it is referring to community public water systems that draw water from one or more contaminated groundwater wells prior to any treatment or blending. Some community water systems, however, cannot afford treatment or lack alternative water sources, and have served water that exceeds a public drinking water standard. Of the 680 community water systems that rely on a contaminated groundwater source, 265 have served water that exceeded a public drinking water standard during the most recent CDPH compliance cycle (2002-2010). This report examines the state of knowledge about the causes of salinity increase in the system and opportunities to improve the Delta as a source of municipal and agricultural water supply. It begins with background information about salinity, its measurement, and its impacts. Following that, we present observed salinity in the Bay-Delta system. 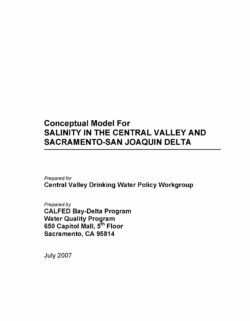 The conceptual models section, the core of this report, then seeks to explain the forces and processes (drivers) that cause the salinity patterns we observe. The computational models section introduces some of the tools available to assist with salinity management and planning. The last chapter explores the implications of the conceptual model for monitoring and management of salinity. Public drinking fountains are disappearing across the U.S., yet many people – including children, commuters, joggers, tourists, and the homeless – rely on them for cheap, accessible, and safe municipal water. Concerns over drinking water quality and possible disease transmission as well as widely-publicized water contamination incidents are both contributing factors in the decline. Are drinking fountains truly a cause of illness? 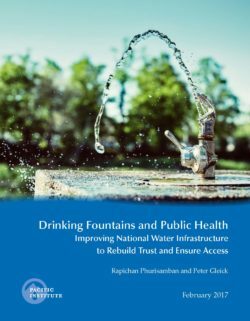 What would it take to rebuild public trust in this important water infrastructure so drinking fountains can continue to be a safe, accessible resource for those who rely on them? In this Pacific Institute report, the authors examine epidemiology studies and other evidence of drinking fountain-related health issues. They find limited evidence of a causal relationship between illness and the use of drinking fountains. Further, problems that were identified can be traced to contamination from poor cleaning and maintenance or from old water infrastructure in buildings, rather than contamination at the point of use, and these problems can be fixed. Providing a reliable supply of safe drinking water is the primary goal of public water systems in California. To achieve this goal, public water systems must develop and maintain adequate water treatment and distribution facilities. In addition, the reliability, quality, and safety of the raw water supply are critical to achieving this goal. In general, public water systems depend greatly on the work of other entities to help protect and maintain the quality of the raw water supply. Many agencies and organizations have a role in protecting water supplies in California. For example, the basin plans developed by the regional water quality control boards recognize the importance of this goal and emphasize protecting water supplies — both groundwater and surface water. A public water system is defined as a system for the provision of water for human consumption, through pipes or other constructed conveyances, which has 15 or more service connections or regularly serves at least 25 individuals daily at least 60 days of the year (Health and Safety Code Section 116275[h]). Public water systems are divided into three principle classifications: community water systems (CWS), non-transient non-community (NTNC) water systems, and transient non-community (TNC) water systems. As the name indicates, CWS serve cities, towns, and other residential facilities occupied by year-round users. Examples include everything from apartment complexes served by their own wells to systems serving California’s largest cities. NTNC systems are public water systems that are not CWS and provide water to the same non-residential users daily for at least 180 days of the year. Examples include schools, places of employment, and institutions. TNC systems are places that provide water for a population that mostly comes and goes. Examples include campgrounds, parks, ski resorts, rest stops, gas stations, and motels. CWS serve approximately million of the estimated 37.7 million people throughout the state, or 97 percent of the state’s population. The remaining estimated 1.1 million people in the state (3 percent of the population) receive their drinking water from private wells serving their individual residences or from other sources. Virtually every Californian and visitor to the state will use drinking water from a regulated public water system through their work, while on vacation, or while traveling through the state. Drought and Equity in California is the first statewide analysis of the impacts of the drought on California’s most vulnerable communities. 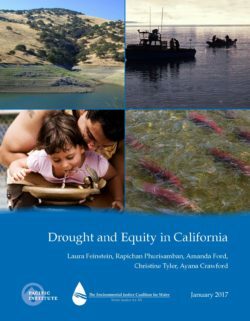 This report provides information community groups can use to advocate for their own interests, as well as to inform policymakers and other decision-makers interested in crafting more effective drought response strategies, particularly to address the needs of the state’s most vulnerable communities. The report finds that during the state’s ongoing drought, water shortages and price hikes affected access to safe, affordable water for Californians, with substantial impacts on low-income families and communities burdened with environmental pollution. The report also examines the effects of a rapidly declining salmon population on commercial and tribal fishermen and finds that the decline and variability of salmon populations during droughts has impacted those dependent on the fish for income, food, and cultural traditions.